Nov. 10, 2016 7:00 a.m.
One day a year, Canadians pause and reflect on the service and sacrifice military members have given to the country either overseas or domestic. In Prince Rupert, there are more than 70 members who belong to the Legion Branch 27. One of those members is Les Gordon, a humble Nova Scotian and a self-proclaimed land lover who wanted a bit of excitement in his early years. “I was in the First Battalion of the Black Watch. 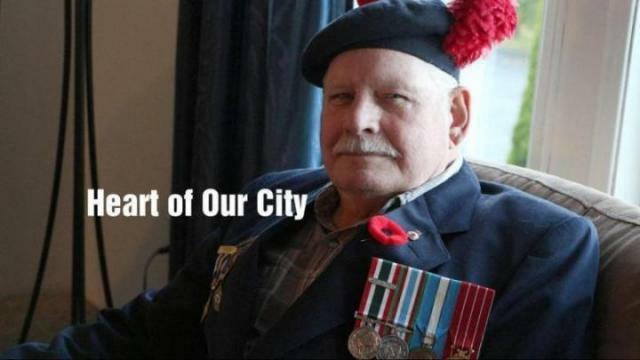 It’s a Royal Highland Regiment of Canada until it was disbanded,” he said resting in his armchair digging deep into his military past. He started in the Air Cadets when he was 13-years-old, too young to join, and when they discovered his age he was kicked out. Later, he joined the Royal Canadian artillery in the militia and did exercises with heavy anti-aircraft for two years. All of his brothers were seamen, and his oldest brother was in the merchant navy during the Second World War. Gordon served in Germany as tension built up between the Eastern and Western blocs during the Cold War. In the divided country, he was stationed in Werl, part of the Western bloc that included the U.S., Canada and NATO allies. He was out doing maneuvers when Eastern Germany began to build the Berlin Wall. Soon after he was moved to be closer to that section. “You weren’t too informed about anything to that nature of what was really going on. They just came along and said you’re going here and you’re going there,” he said. There was one incident in Germany that stays with him today. His unit was doing a maneuver and they were on top of the tanks. Gordon had his rifle slung over his shoulder. As they were going through the brush, his rifle caught a branch and he was thrown off the tank and knocked out. While in the military, Gordon toured many regions of Europe for training or peacekeeping efforts. For six months between 1967-68 he served in Cyprus, one of Canada’s longest overseas commitments. The island is slightly smaller than Cape Breton, and only has a population of 800,000 people but when the country gained independence in 1960 tensions rose between two ethnic groups. “We were right on the shores of the Mediterranean. That was a nice place but you never knew when anything was going to happen there. We were always on alert. You didn’t have much time to yourself. You never knew where you were going to be,” Gordon said. He did a tour in Belgium, did winter warfare training in Norway and exercises with artillery on the shores of Lake Ontario. He also took part in combat training Tasmanians who travelled to Canada pursuing an officer title. Between tours, he would return to Nova Scotia to his wife and three kids. He met his wife, Marie, in 1946 when she moved to Dartmouth and befriended his sister. “At times it was hard, like when he went to Cyprus, our youngest was 13-days-old. Then the middle one didn’t know him when he came back. Our girl did because she was three-and-a-half-years-old,” Marie said. In 1971, the military offered Gordon another posting in Germany but there was no schooling available for his children. Instead, he decided to turn down the posting and retire. The family moved back to Dartmouth from Gagetown and for the next few years he worked at the marine slipway. As work started to dry up on the East Coast, he was drawn to the west. His brother-in-law said there was a lot of work in Prince Rupert, and so he packed up and the Gordon family moved there in 1975. “When I first got here in 1975 I planned on working at the mill. When I got here on a Friday and then it was done for three months. I took a few little odd jobs,” he said. Eventually, he found steady work at the grain elevator and after 20 years of work he retired. Every year, Gordon goes to the Remembrance Day service. He hasn’t missed a service since the mid-40s other than when he was in Cyprus and Germany. “Remembrance Day — most of it is sad. A lot of my buddies that I remember and was pallbearers for them both in Germany and in Gagetown and so on like that. They were very good friends and I miss them a lot,” he said adding that the service is a way to celebrate their life and he always has a little tottie for them.